My new book, The Beatles on the Roof, is the first book ever published about the Beatles’ rooftop concert. It’s out now in the UK, Australia and North America. UK readers can buy it now at Amazon here. This is a detailed look at the Fab Four’s iconic final gig. While ordinary folk went about their business on January 30, 1969, the Beatles risked frostbite and police handcuffs to bring their music to the masses in Savile Row. I’ve spoken to a host of people who were actually there that day – helping the band, enjoying the music, or attending the scene in Metropolitan Police uniforms. Many of them tell their stories for the first time, and I’ve unearthed other fascinating facts about that special moment in rock’n’roll history. Even if you’re not a Beatles fan, people tell me that there’s plenty to enjoy in this detailed snapshot of the end of the Swinging Sixties. 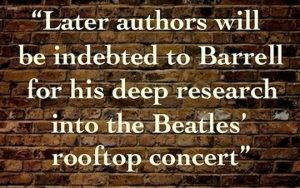 “An excellent account… The Beatles’ story has been told countless times, but Barrell’s account seems fresh and revealing… Mayfair is wonderfully depicted as an area under siege by rockers in the late ’60s” – Classic Rock magazine. “Barrell knows a ridiculous amount about the rooftop” – Roofs and Roofing magazine. 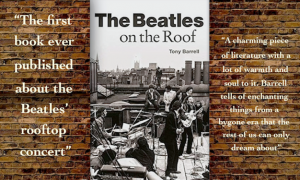 The Beatles on the Roof is out now in the UK, and available at Amazon here…. You can buy it from Amazon in Australia here, or at Angus & Robertson (Australia) here. Just follow those links to buy the book. Alternatively, you can order it any local British bookshop, or even at a supermarket or grocery store that stocks books. If they can’t get you a copy, ask me and I’ll find one for you. Share the post "NEW BOOK OUT NOW"
A fantastic book! I can’t think why anyone hasn’t written a book about the rooftop gig before. Great job.